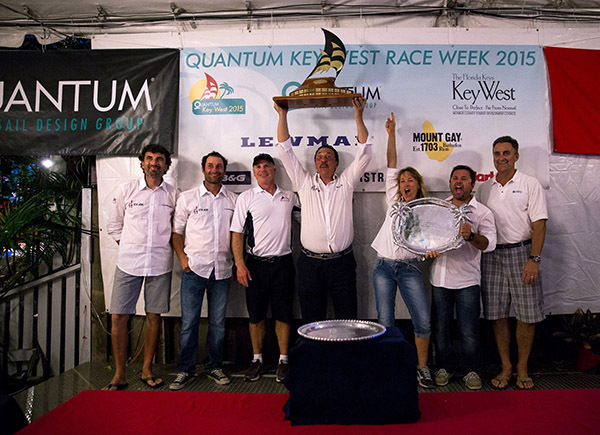 Carlo Alberini and the crew of Calive Network, named Quantum Sails Boat of the Week for 2015. Photo by Keith Brash. 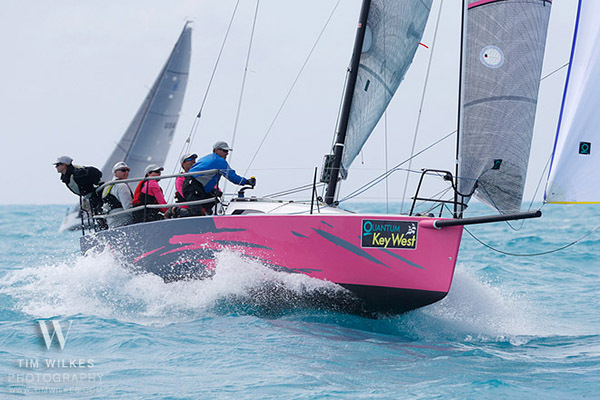 Many of the marquee classes were decided on the last day of the regatta, which delivered the toughest conditions of the week at Quantum Key West Race Week 2015. Howling winds, including gusts of up to 30 knots, and rough seas challenged the competitors, but the top contenders met the challenge to claim overall victory. That was certainly the case aboard the the Judel-Vrolijk 72-footer Bella Mente, the Quantum-equipped minimaxi skippered by Hap Fauth of Minneapolis. Fauth took first place in both races on Friday, holding off Gunther Buerman and his team on Numbers. Bella Mente won six of 10 races and posted a low score of 19 points, two better than Numbers. Fauth captured his fourth victory in Key West despite a grounding incident on Wednesday and a damaged keel bulb. In the Swan 42 Subclass, Paul Zabetakis and Impetuous managed a half-point victory over runner-upVitesse. Zabetakis won five of 10 races, including one tie that gave him the half point he needed to take the overall win. The J/88 class was decided on Friday with Rob and Sandy Butler on Touch2Play Racing winning both races. That clutch performance tied the Canadian with Deviation, skippered by Iris Vogel of New Rochelle, N.Y. Touch2Play won the tiebreaker by virtue of more first place finishes. J/111 Utah, Bradley Faber. Photo by Tim Wilkes. The J/111 also had a wire-to-wire victory, with George Gamble on My Sharona finishing on top. Quantum customers claimed the other podium spots as well. Quantum pro Scott Nixon called tactics on My Sharona, which displayed superb boat speed in all conditions, winning five races and placing second or third in four others. J/70 was the largest class of the regatta with 54 boats and featured a slew of top professionals. The week-long dog fight resulted in constant changes at the top of the standings, but it was skipper Carlo Alberini and his Italian team on Calvi Network who emerged as overall winner. J/70 Calvi Network, Carlo Alberini - Photo by Tim Wilkes. Calvi Network tactician Branko Brcin and trimmers Sergio Blosi and Karlo Hmeljak helped the team sail consistently, finishing in the top 10 in nine of 11 races. 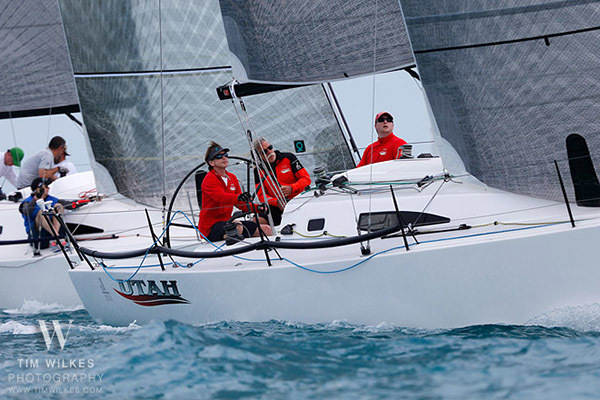 Calvi Network totaled 49 points, eight better than the runner up, and earned the ultimate prize at Quantum Key West Race Week – Boat of the Week. Overall, Quantum boats earned top-five finishes in nine divisions, including victories in IRC 1, Swan 42, J/70, J/88, and J/111. 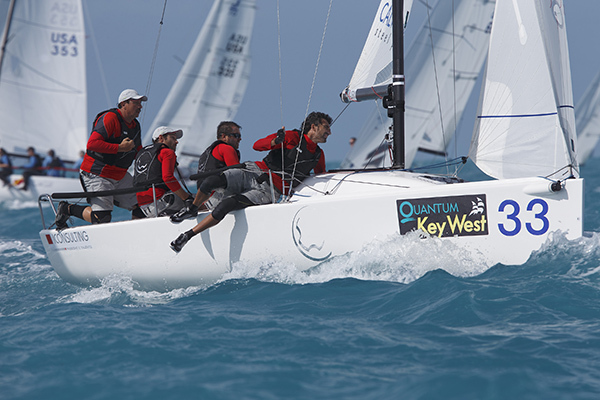 Quantum Key West Race Week was January 19-23, 2015. For more information on Premier Racing, click here. To see photos by Ken Wilkes, click here. To see photos by Photoboat, click here. To see photos by Ken Stanek, click here.